Tokyo: Japan’s incoming emperor Crown Prince Naruhito faces the delicate task of balancing tradition within the world’s oldest monarchy and his own modern values, including protecting his family from the palace’s rigid rules. The 59-year-old heir has not been shy about criticising the sometimes stifling lifestyle imposed on royals, particularly as his wife Masako has struggled to adapt to imperial life. And like his popular father Akihito, he has warned of the need to remember World War II “correctly,” without downplaying Japan’s early 20th-century militarism. Born on February 23, 1960, Naruhito was the first Japanese prince to grow up under the same roof as his parents and siblings - royal children were previously raised by nannies and teachers. He studied for two years at Oxford University in the 1980s after graduating with a history degree in Japan, and reportedly adorned his residence with a poster of American actress Brooke Shields. In Britain, he was able to shed some of the strictures of royal life in Japan, mingling with other students as well as the British royal family, and he has spoken fondly of that period. In 1993, he wed Masako Owada, who will become empress when Naruhito assumes the Chrysanthemum Throne in May. The daughter of a diplomatic family and educated at Harvard and Oxford, Masako left behind a promising diplomatic career of her own to marry into the royal family. But she struggled to adjust to cloistered life inside the family, punctuated by occasional and highly choreographed public appearances. She also came under enormous pressure to bear a son because Japan’s imperial succession excludes women. This scrutiny only intensified after she gave birth to her daughter Princess Aiko in 2001 - the couple’s only child. In 2004, Naruhito accused palace minders of stifling his wife’s personality, in unprecedented public remarks. “To me, Masako seems worn out in her efforts to adjust herself to life as a royal over the past 10 years... It is also true that there was something that amounted to a denial of Masako’s former career,” he said. The same year, the palace disclosed that Masako had been undergoing treatment for stress-induced “adjustment disorder” for almost her entire marriage. Naruhito later apologised for his remarks, but he has called for “new royal duties” to fit modern times. The pressure on Masako eased somewhat when her sister-in-law gave birth in 2006 to a son, the now 12-year-old Prince Hisahito. Naruhito has also followed his father’s lead by hitting back against revisionism on Japan’s role in World War Two, with remarks seen by some as a rebuke of Prime Minister Shinzo Abe’s nationalism. “Today when memories of war are set to fade, I reckon it is important to look back on our past with modesty and pass down correctly the miserable experience and the historic path Japan took from the generation who know the war to the generation who don’t,” he said in 2015. Naruhito and Masako are expected to pursue the role of comforters-in-chief crafted by the current imperial couple, who have won public support for their appearances alongside the victims of natural disasters. They “will probably follow the current style of standing side-by-side with the public - visiting disaster-hit areas and praying for peace while mourning the war dead,” said Hideya Kawanishi, an associate professor at Nagoya University and Japanese history expert. 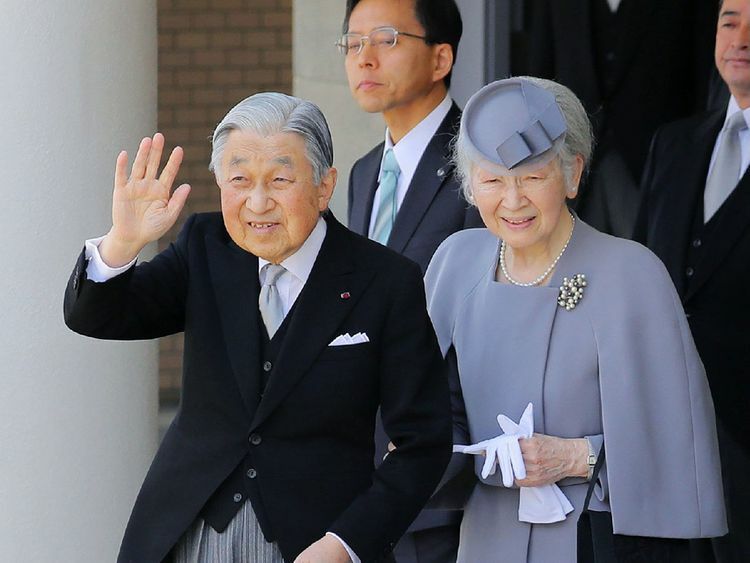 But the couple “will not be able to do the same amount of activities as the current imperial couple do” given Masako’s health, Kawanishi told AFP. In a statement released on her birthday in December, Masako pledged to do her best despite feeling “insecure” about becoming empress. In the candid statement, she said she was recovering and could “perform more duties than before”, crediting the “powerful support” of the public. Doctors have warned however that she will need to continue treatment and is vulnerable to fatigue.